We know you’re time is valuable and that’s why we offer the classroom portion of our class online and on demand so you can study when and where you want… even on a mobile device. Once you’ve mastered the classroom material, spend time in the field with our soil scientists and other students learning real-world application of the material. We offer multiple field locations for each training so you get to experience soil variability across geographic areas. Classroom and book learning is important, but when dealing with soils, nothing beats getting into the field and learning by doing. Our goal is to raise your level of soil knowledge and make you a more confident and polished professional. Our class format saves you time and money by limiting your travel for only the field exercises, leaving you more time to stay plugged in with your clients and projects. 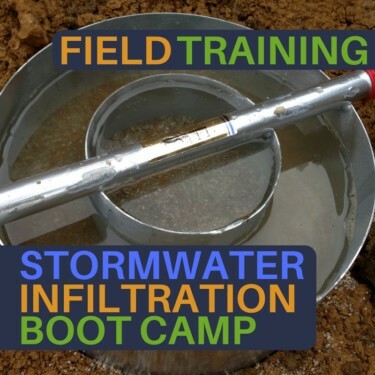 In this class we take a close look at key areas to successful stormwater infiltration siting, testing, design, and construction. When working with a system that relies heavily on soil to provide an ecosystem service, we must have a firm understanding of the science behind the processes. Successful stormwater management depends on using the right soil, using an appropriate design infiltration rate, and fulfilling the assumptions behind the design by taking the right steps during construction. In the online classroom material, we’ll begin by studying how the use of infiltration to help renovate stormwater is predicated on understanding the physics behind how water behaves at the soil-water interface as well as within the soil matrix. A firm understanding of these relationships will assist in proper site selection and design parameters. Then we’ll look at the limitations that exist in some soils that inhibit the proper renovation of stormwater. Additionally, with a firm understanding of soil properties that govern renovation success, we go over infiltration testing techniques and best practices. By identifying soil limitations and learning to test the correct soil horizons using sound protocols, more accurate data can be generated to provide a better decision framework for designers. Finally, no matter how much science we know, no matter how many infiltration tests we conduct, if care isn’t taken during construction, none of it matters. We discuss best practices to reduce compaction, the importance of organic matter, and planning construction with infiltration in mind. Students will complete online classroom study through our Soil Hub learning modules. These modules can be completed all at once or the student can stop and start at their own pace with the option to save their progress and return later to complete each lesson. During the online classroom portion of the course, students will advance their technical foundation with in-depth study on the science behind stormwater infiltration. During the field component, students will get practical in-field training in infiltration testing methods and techniques and will work through how to interpret results to provide meaningful data for functional designs by spending valuable field time with our soil science instructors.